Rama II by Arthur C Clarke and Gentry Lee, Sci Fi. Book is in good condition, all pages intact. It has been years since the alien spacecraft Rama passed through our solar system, and now another alien vessel approaches. A team of scientists and investigators are sent to board the Rama II, but what they find there is much more than anyone bargained for. 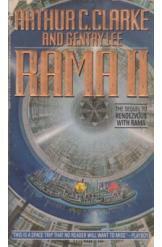 Book two of the "Rendezvous with Rama" series.